The Holy Ground of American racing. 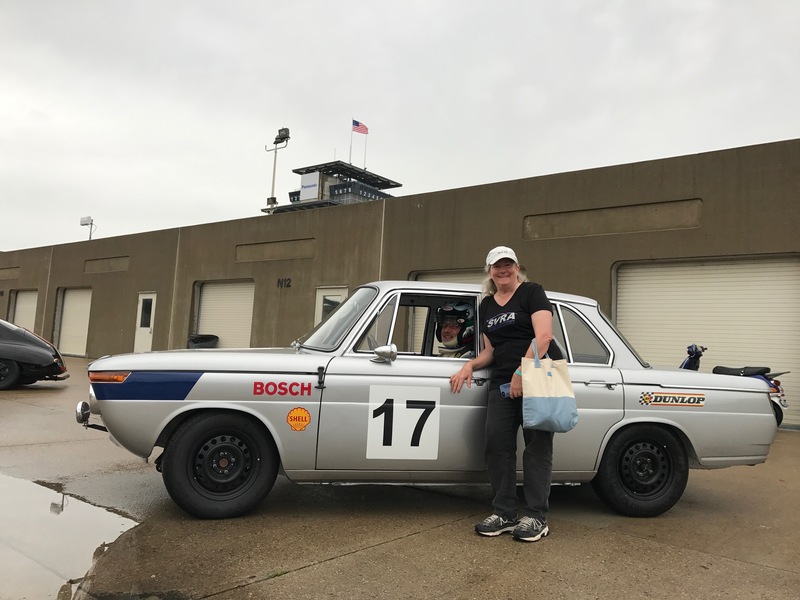 We made the trip back east to participate in SVRA’s Brickyard Vintage Invitational held each year at the Indianapolis Motor Speedway. This venue is steeped in history. 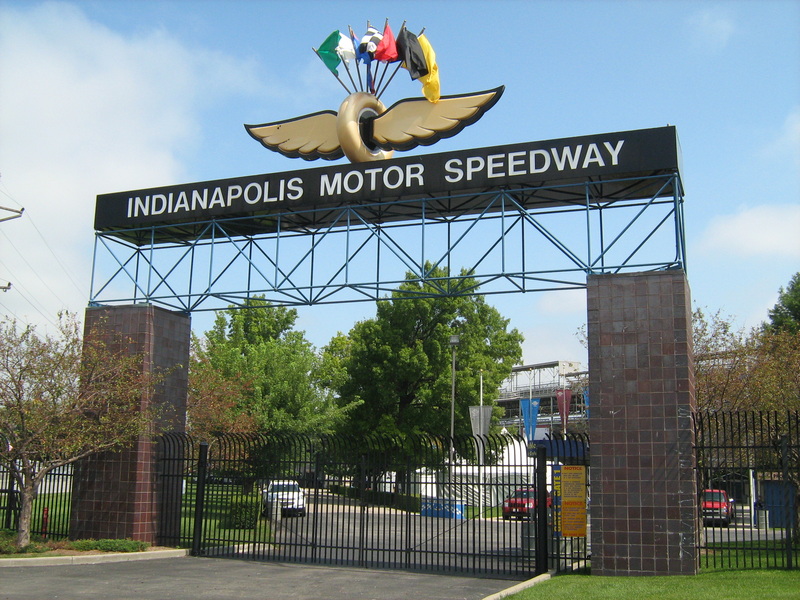 They have been racing at the Brickyard for over 100 years. It is mind boggling to think about all the drivers who have raced there over the years, as well as all that has happened there. It sends shivers down your spine the first time you drive off pre-grid, under the “Gasoline Alley” sign and out into the canyon of the main grandstand along the front straight. The track we used was made up of the front straight and portions of the F1 course. The twisty bits are pretty tight and are separated by 2 long straights. It is just over 2 miles around. We took the 1800 and Luigi. 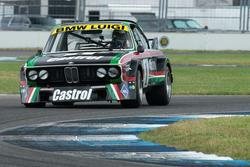 The 1800 raced in Group 3, and Luigi in Group 12A. I spent the Thursday practice sessions learning my way around the track. It isn’t hard, but to get a good time requires some precision. It is very easy to overdrive some of the corners and your lap time will suffer. Friday had 2 qualifying sessions for each car. Because it was hot (91 degrees and 75% humidity), I chose to just run the morning session in each car. I didn’t think the lap times could be any faster in the heat of the afternoon. 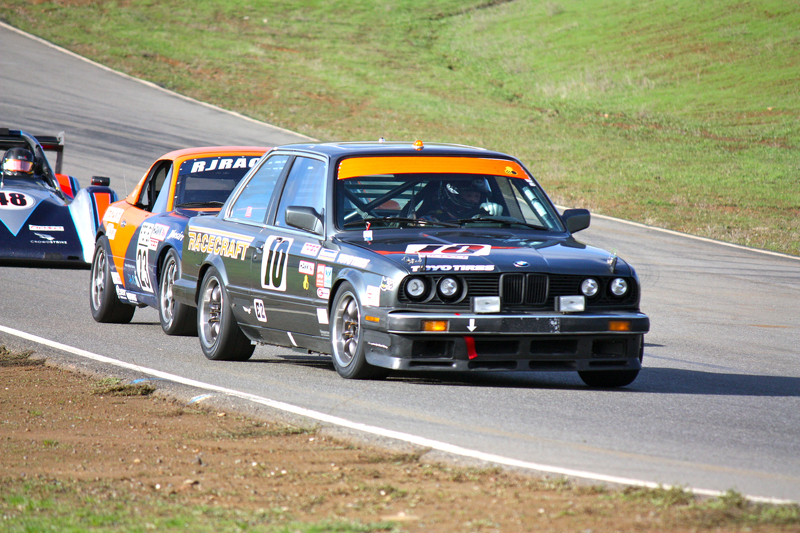 There were several other series racing with the vintage cars during the weekend. The SCCA Trans-Am series was there, along with the Pro Spec Miata series. It was fun to have a close look at the cars and to watch them on track. The Trans_am cars can really haul the mail! The 1800 suffered down the long straights and I was able to only qualify in 10th with a lap of 2:01.5. Luigi, on the other hand, loved hooking-up coming out of the corners and flying down the long straights. He qualified on pole with a 1:43.8, 2.5 seconds faster than the 911 of Tom Clark. The feature races on Saturday were in the morning when it was a bit cooler. I managed to finish 12th in the 1800 after a race-long battle with Allen Goode in his TR4. At the drop of the green flag Luigi surged away from the field and never looked back. I ran the entire race with out any issues and finished almost 20 seconds ahead of 2nd place. An all BMW podium. Bill Glavin in 2nd, and Kevin Ruble in 3rd. 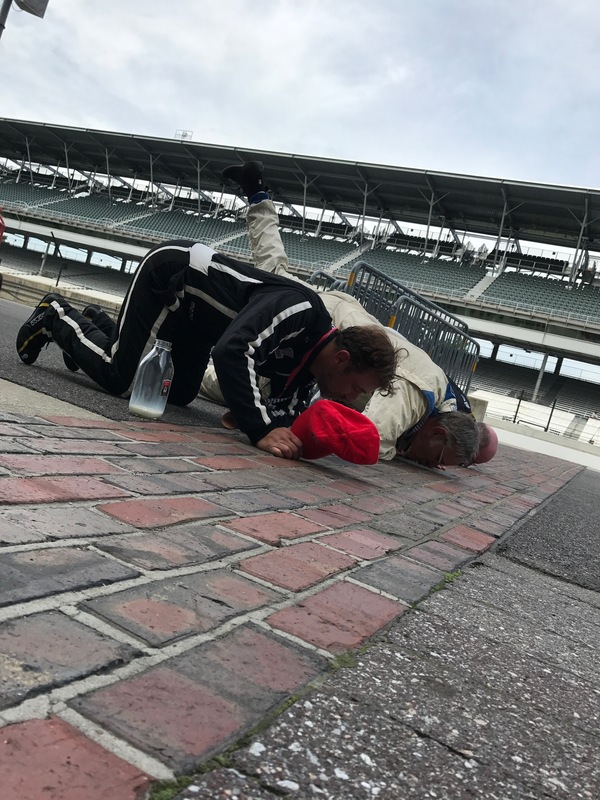 It was very special to stand on the top step at Indy and get to drink the milk and kiss the bricks. Sunday morning I ran the 1800 in the 1 Hour Vintage Enduro. It was wet and already pretty hot when the race started at 8:00 AM. I only ran about half the race as I had 2 more races to run later in the day. It was fun racing on a wet track with some big-bore cars. I could have fun with them in the turns, but then they would leave me in the dust on the long straights. The 2 feature races on Sunday went well. I had back-to-back races, with the 1800 out first. As with the Enduro I only ran a few laps before coming in and cooling down before jumping into Luigi. Couldn’t do it without Mary’s support. Thank You! Luigi’s Feature race went just like it did on Saturday. I surged ahead at the green flag and never was challenged. 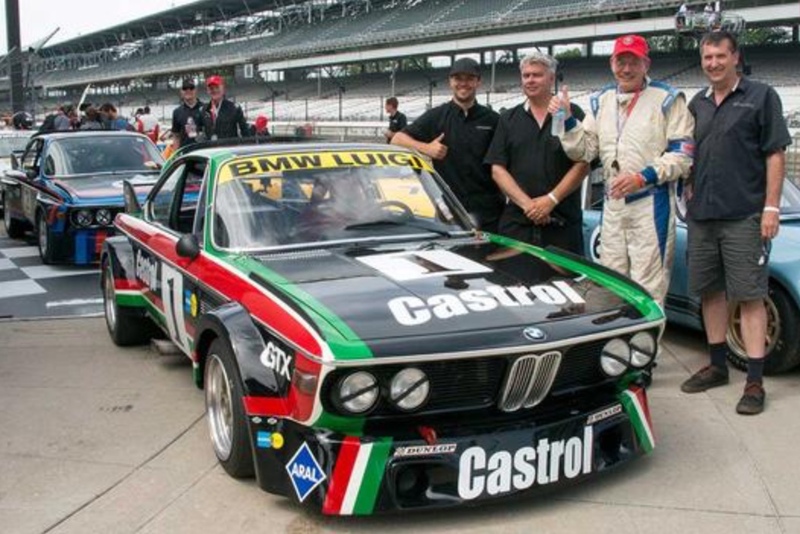 2 wins at Indy for the old guy- Luigi not me. After 40 years he still knows how to get the job done! These are the guys that make it happen- Erik, Terry, and Jim (L to R). This year SCRAMP started a new race with hopes to build it into a premier vintage race in the coming years. It features cars from the 1970’s through the 1990’s. There were groups for F1 cars, Atlantic cars, and big block Trans-Am cars. However, the largest grid for this first event was the 2.5 Trans-Am Sedans. 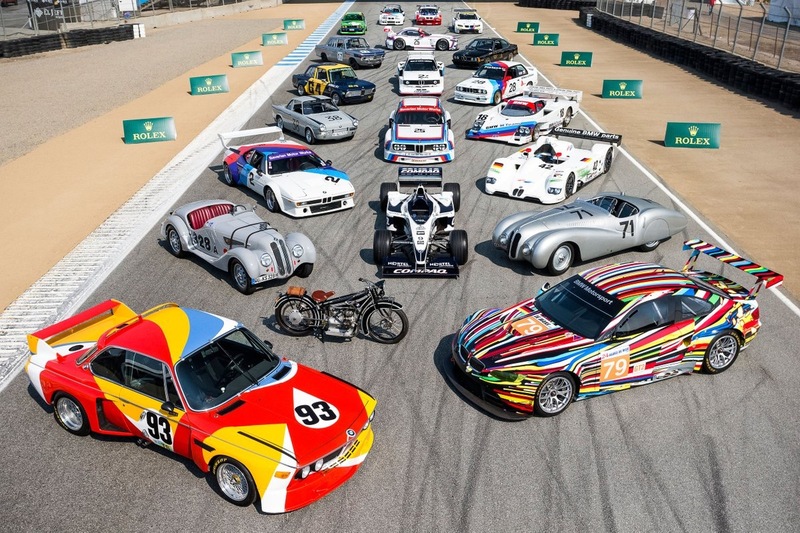 Group E was made up of BMW 2002’s, Alfas, 510’s, a Mini, and several Porsches. 34 cars total! I entered my #34 2002. This car has always been a race car. 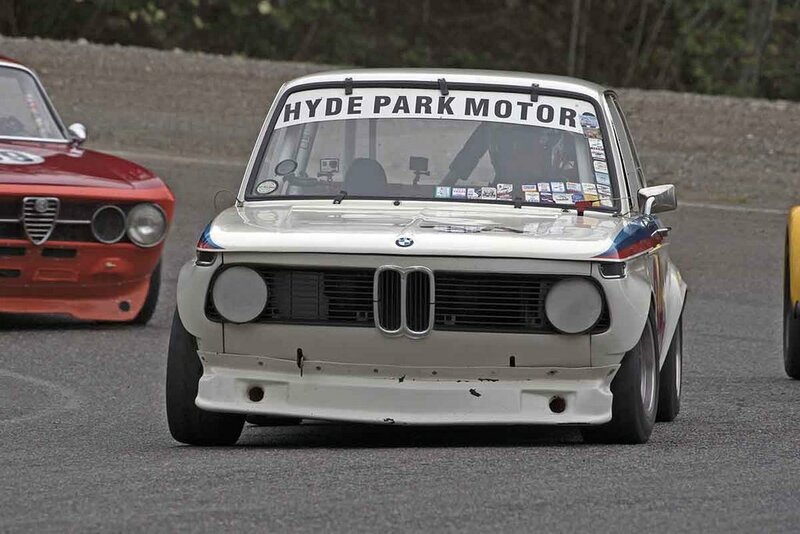 It taken off the truck at Hyde Park Motors and built into a race car. 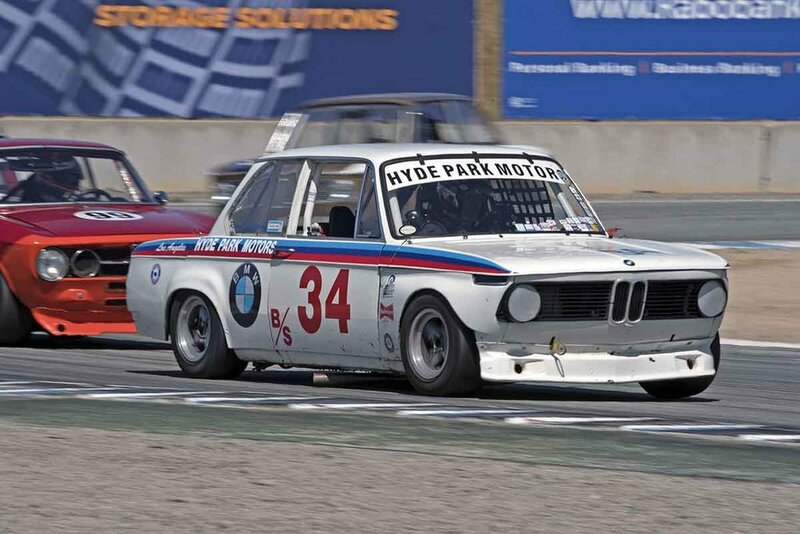 In fact, it was the first BMW to win points in a Trans-Am race at Riverside in 1968. 34 got to mix it up with many of the same cars he raced against back in the day. There were some fast drivers and fast cars in our group, including Sam Smith in a 2002, and Troy Ermish in his always fast Datsun 510. The racing was some of the best I’ve experienced for several years. I managed a 4th in the feature race, which was not too shabby given the quality of the field. 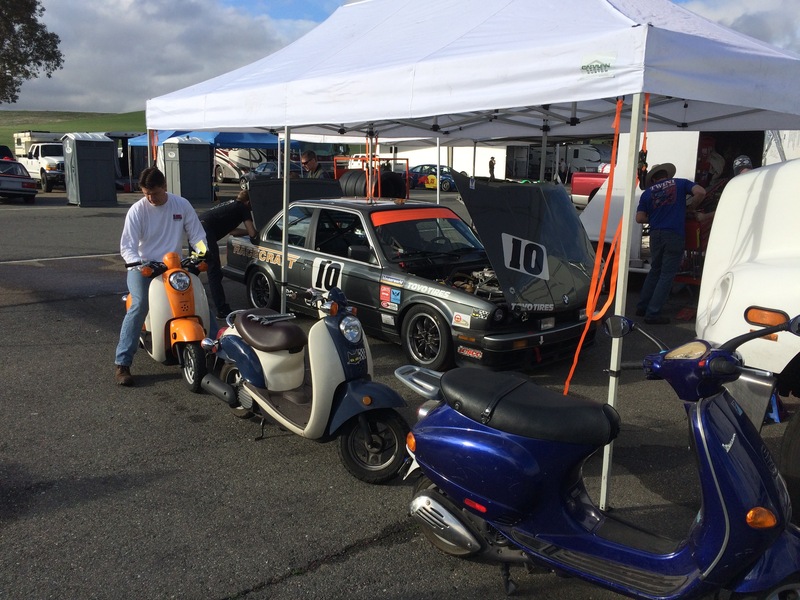 Our 2017 season began with the David Love Memorial Races at Sonoma Raceway on March 31 – April 2, 2017 put on by CSRG. I brought my Koepchen 2002 to run in Group 8, and my Chevron B16 to run in Group 7. It was a beautiful weekend, mid 70’s and lots of sun. Quite a change from our long, cold winter here in Oregon. With all the rain they have had in CA the hills around the race track were a bright green. A perfect setting for a weekend of racing. The K2002 performed well all weekend. Let’s start with the 2002. I was trying a new set of the Avon ZZS DOT radial tires this weekend. They are a little wider than the Toyos we normally run on this car (215 mm vs. 205 mm). I found I liked them a lot. They were very consistent through a run, and didn’t seem to be as affected by temperature as the Toyos. I love driving this car at Sonoma. It is a track that suits the 2002 perfectly. As a result the car punches above its weight. By that I mean it can compete well against cars it normally would be easily beaten by. I was able to turn a 1:55.3 on Saturday morning during qualifying! That is a lap average of about 90 mph. The car runs in Group 8 at CSRG events. This group is made up of sedans and sports cars from the mid 1960’s up to the mid 1970’s. There are GTO Corvettes, Camaro, Porsches (911’s & 914’s), and Datsuns (510’s and Z’s). Quite a mixed bag of cars. David Martin gets his GTU Z car out of shape in front of me in Turn 7. 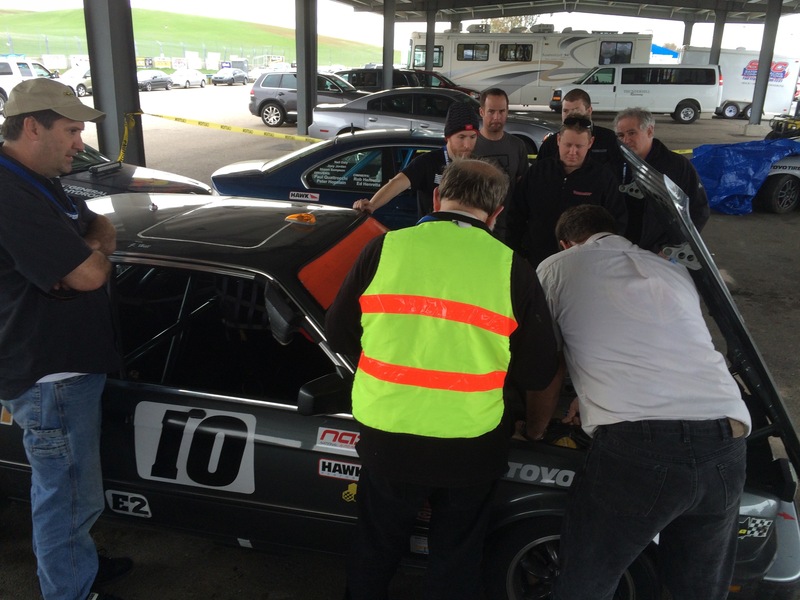 I qualified 10th out of 23 cars and began the race outside of David Martin’s GTU 240Z. I was able to get ahead of him at the start, but on lap 2 he tried to out brake me going into Turn 7 and got behind on his steering and I was able to repass him. I held off David and 2 other Z cars for the next 6-7 laps until he was able to out brake me again for Turn 7 and get by. Then down in Turn 11 the other 2 Z’s snuck by me. I ended up finishing 10th with a best race lap of 1:56.4. I chase a Lola T-70 through Turn 2 at the David Love Memorial Races. 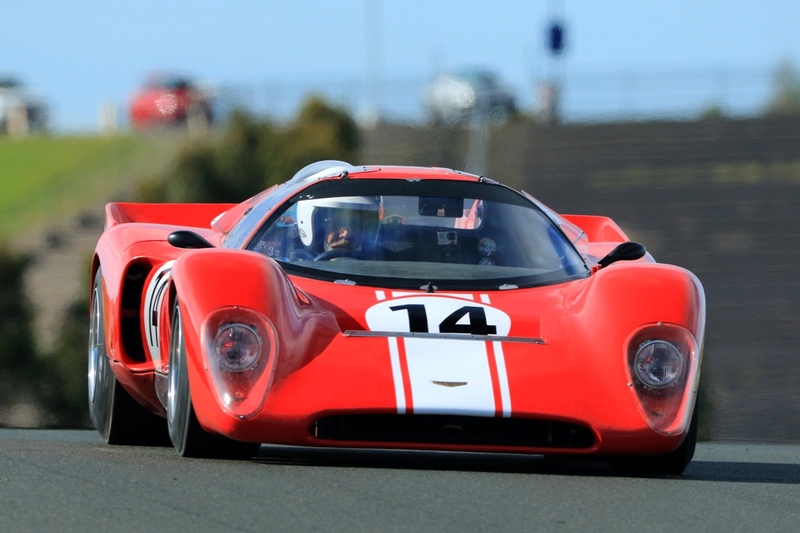 I also entered my Chevron B16 this weekend. I am still trying to learn to get the most out of this car. It is quite different than my other production based cars. My biggest problem is that I don’t fit very well in the car so I am not comfortable and confident. I really struggle with consistent footwork on the pedals. 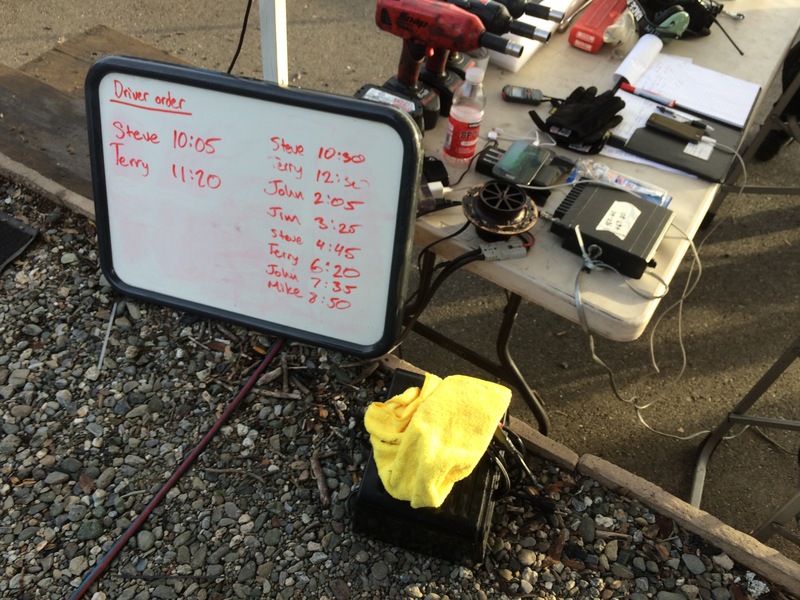 Jim @ Racecraft will be doing some modifications to the pedals to try and help. The car runs in Group 7 with CSRG. This group is made up of both closed and open wheeled cars. 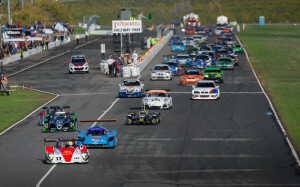 There are a lot of Formula Atlantic cars, some Can-Am cars, an mid-1980’s F1 car, and a few 2 liter sports racers in the group. I started 10th and finished 9th in my race, with a best lap of 1:48.7. My goal was to log laps and work on feeling comfortable driving the car. My best guess is that I will be turning 1:45’s once I get more experience with it. Here’s the video from the weekend. Thanks for watching! A box among the Bats. 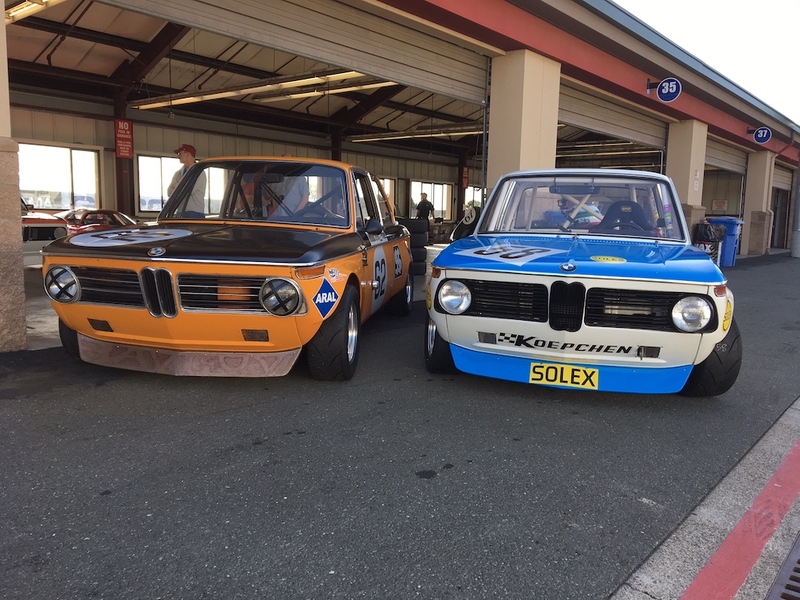 My newly refurbished 1800 Ti got its first track test at the Northwest Historic in Seattle. The mid part of our season consisted of races in Seattle and Portland, both events close to home. 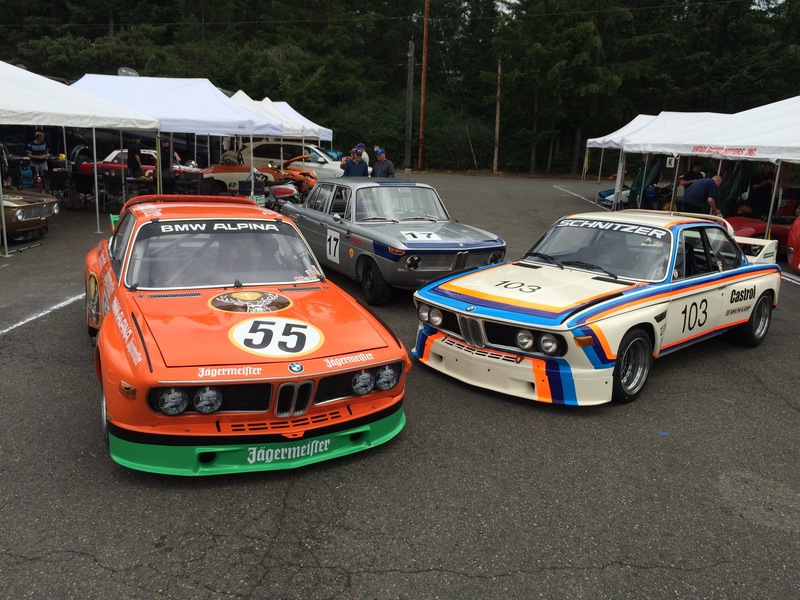 The Northwest Historic put on by SOVREN are always a fun event. This year was no exception. The Portland Vintage Festival was the weekend following Seattle. I raced the 1800 Ti and my Chevron at this event. Luigi is still having some brake issues we need to sort. Our next race was at the Sonoma Historic Motorsports Festival put on by SVRA. Held each spring, it is a great event with lots of great cars, and big crowds of spectators. SVRA does a great job with this event. One of the highlights each year is the R&R party they put on on Saturday night. 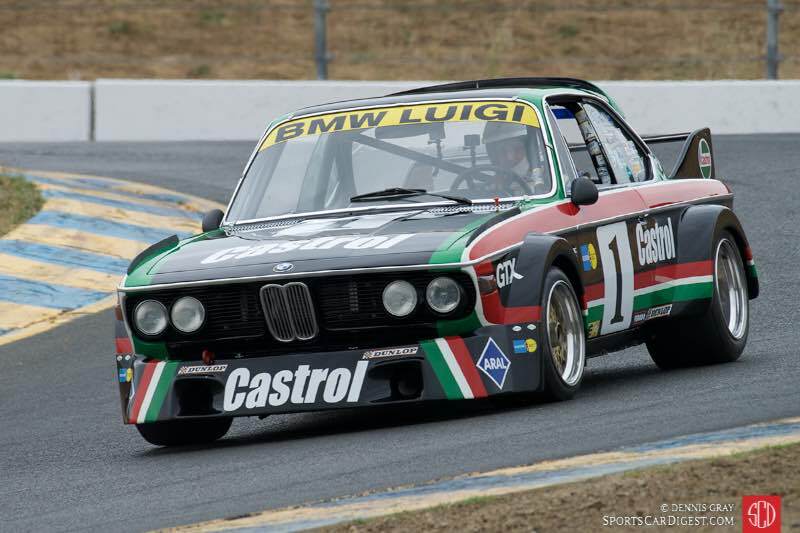 At this event I raced the Willis Special and the Luigi CSL. Both cars ran well all weekend, and I was able to finish 7th with the Willis and 6th in the CSL with a best lap of 1:53.4. 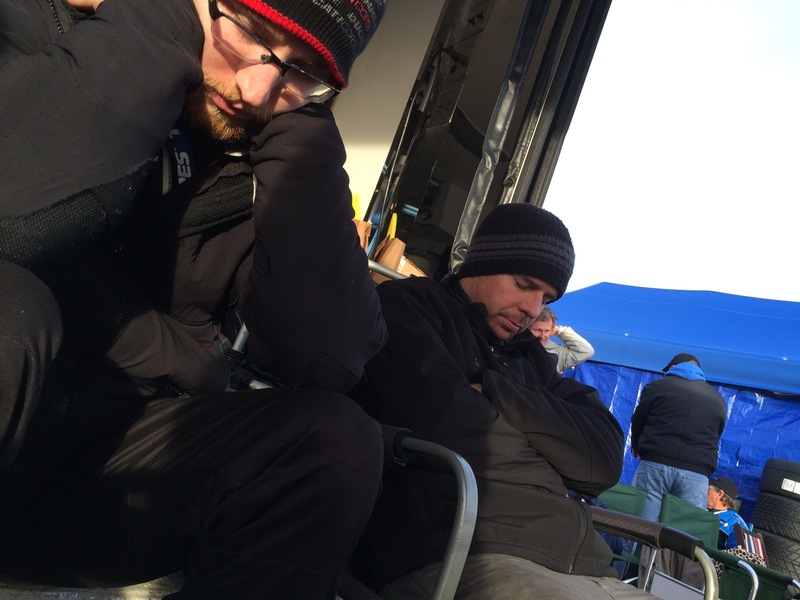 John Murray and Ed Matuisha are two people we enjoy spending time with at the races. I ran pretty much all alone in the Willis. The car slots in between the much faster F1 cars and the much slower cars in the group. One of the great things about this group is the sites and sounds and smells of all the old cars that run in this group. 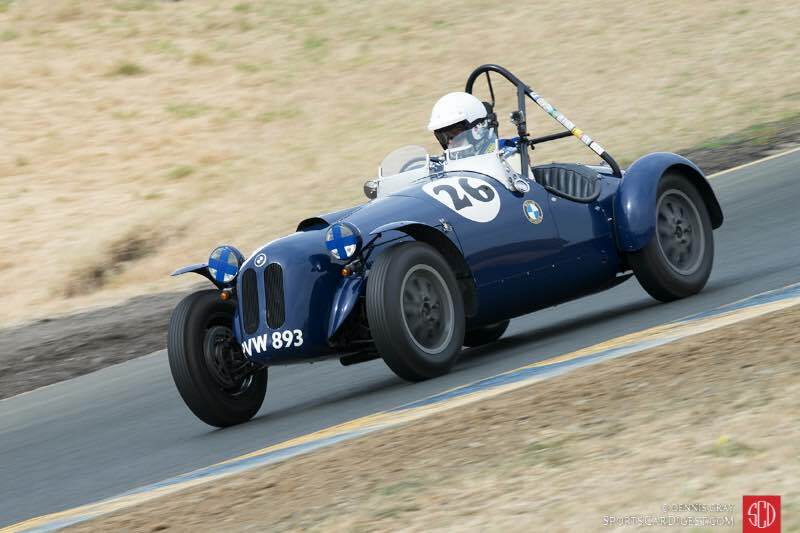 My 1935 BMW 315/1, “The Willis Special,” in turn four. The Willis is a very difficult car to drive. It is extremely loose in the rear end. This trait is particularly noticeable in the Carousel where the road drops constantly as you make the 180 degree turn. 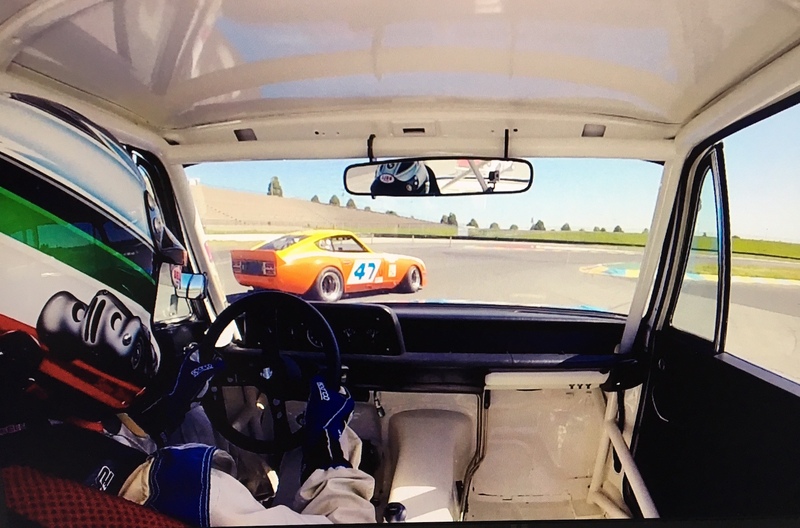 In the CSL I had a great race long battle with Bill Lyon in his 914/6 Porsche. We have raced together many times and we always have fun, close racing. At some tracks he is quicker, and at some I am quicker. Sonoma seems to favor my CSL because of the torque the car has. I am able to really pull Bill coming out of the slower corners. 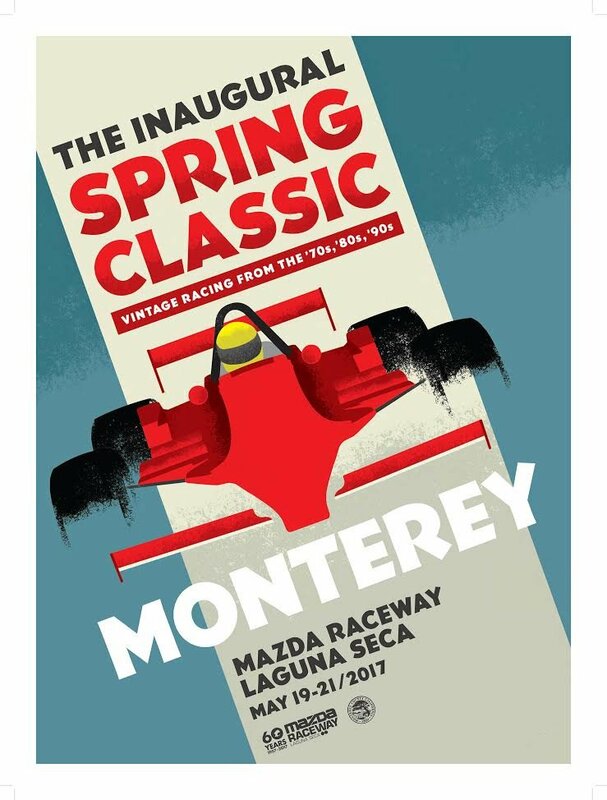 Our opening races of the year were down in California- the David Love Memorial at Sonoma, and the HMSA Spring event at Laguna Seca. 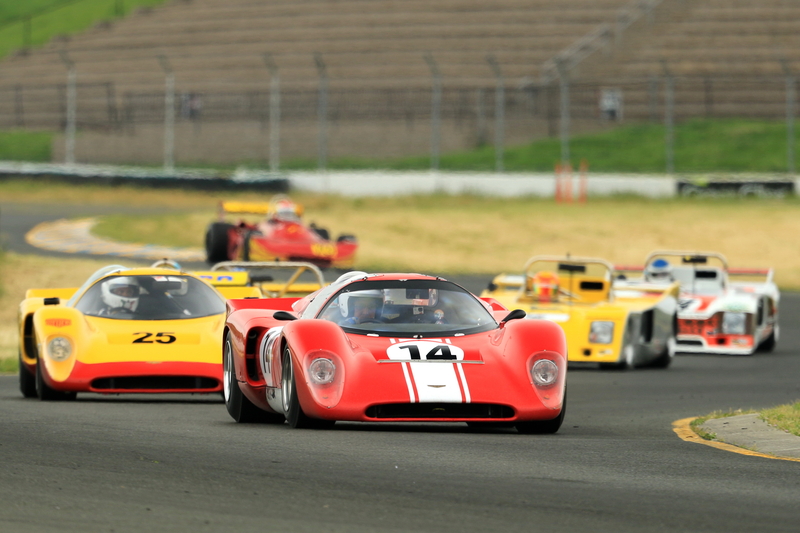 These races would be my first chance to drive my newly acquired Chevron B16 so I was excited for the season to begin. I also raced my trusty Koepchen 2002. My 2002 races in Group 8 which is a mixture of mid and large bore production cars and sedans. Sonoma is ideal suited to the 2002 so they do very well there against the larger engined cars. This was also my first opportunity to drive the Chevron B16 I purchased over the winter. We had to make some modifications to the car so I could even fit into it. We trimmed the bottom of the dash for my knees, took out the dead pedal, and put some spacers in the drivers side window to give me a little more head room. My first experience driving the B16. What a Ride! My objective for this first race was to just get comfortable in the car. It is significantly different than driving my other cars. It is a purpose built race car with a lot more speed than anything else I own. This Chevron has a BMW m10 motor in it. It produces about 220 HP and is very tractable. It pulls hard from about 4,000 RPM up to its red line. The brakes are phenomenal, much more effective than any of my other cars. It has amazing amounts of grip, yet is quite neutral and predictable in the corners. The weekend following Sonoma we went to Laguna Seca for the HMSA Spring Event. I had another great race with John Murray in our 2002’s. I was able to beat him this weekend by out braking him going into the Cork Screw and holding him off for 6 laps. A lot of fun! The Chevron and I continued to get to know each other. Unfortunately I broke a half-shaft in the car during the race and had to retire. Celebrating 100 years as the ultimate driving machine! 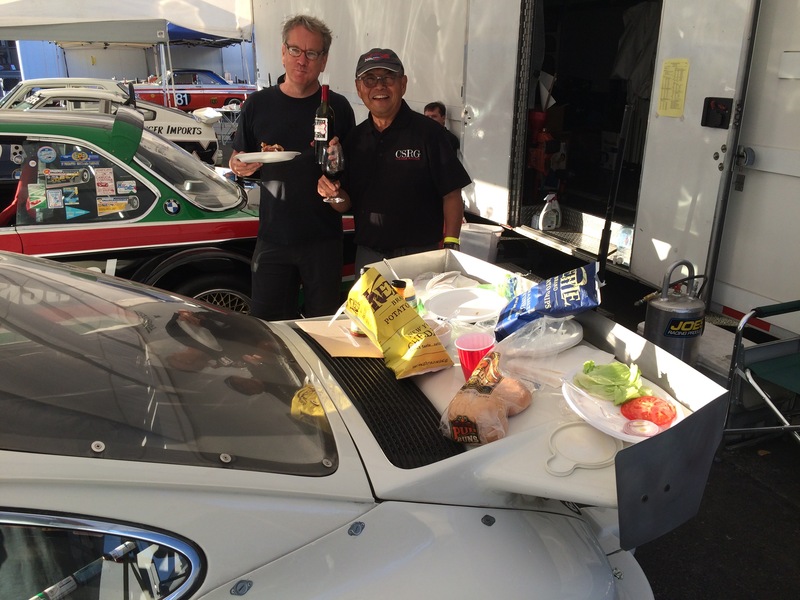 Our big event was the Rolex Motorsports Reunion at Laguna Seca Raceway in Monterey, CA. It’s been a while since I have put a post up on this blog and for that I apologize. We have had a very busy year and I have neglected reporting on it here. I will endeavor to post a report of each race with a link to the video over the next few weeks. 56 Cars take the green flag on Saturday morning. Our car is that orange streak at the way back and to the right. At 10:50 all drivers are to be in their car, strapped in, and ready to go. The pace car leaves the grid at 10:55 and after 1 pace lap the green flag is dropped and the race begins. There were a number a pretty fast cars (and trucks- see the video) that chose not to qualify in the rain. They started at the back of the field, but by Turn 4 of the opening lap they were coming up through the group I was racing with. It got pretty tight a couple of times. We had a plan. Driver rotation and pits stop schedule for Saturday night. After 2-3 laps I settled in and just tried to drive the car smoothly and consistently. Our goal was to make sure we finished, and I didn’t want to be stupid or break the car in my first stint. All in all I drove 5 stints during the race, including the start and the checkered flag. It was quite an honor. 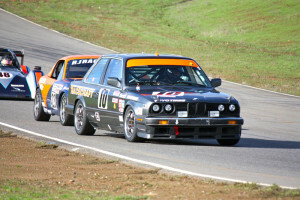 I had raced my 2002 at Thunderhill just a few weeks before this event, so I was very comfortable in the E30. For the 25 Hour race they use a by-pass of Turn 5. It is a blind rise over the shank of the hill. There is quite a camber change as you go over the rise, and it gets worse the more you are to the right. The fast line is staying left, but when the fast cars come by we had to move right for them. Just over the rise the track takes a hard, off camber, right around the base of the hill. It’s quite a handful, especially in the dark. Our race went smoothly until my 10:00 PM stint. About 45 minutes into it morning. I was driving the car just shut down. The lights and everything stayed on, but the motor would not run. I coasted to a stop under the bridge on the back straight. Fortunately not to far from pit in. After a short wait while the pace car picked up the field, I was towed back to the pits and the crew set to work diagnosing the problem. I went off to bed for a 4 hour sleep before my next scheduled stint. 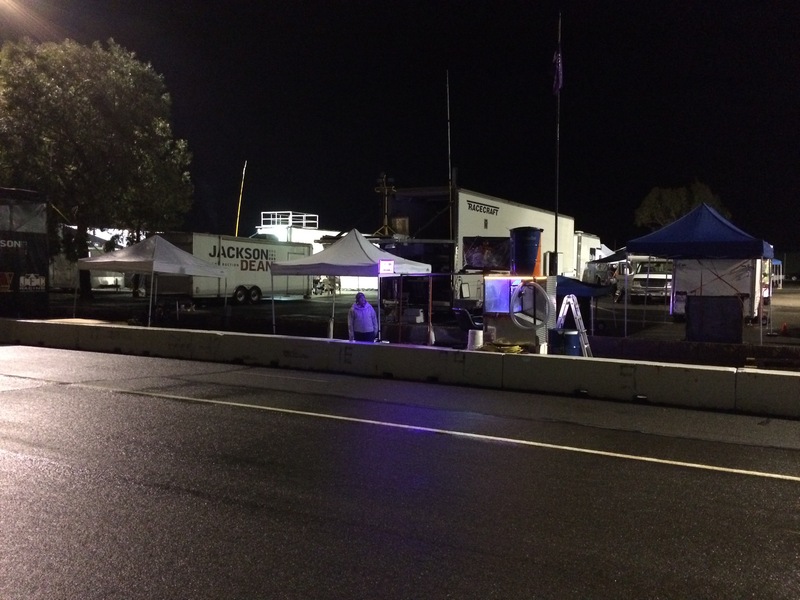 The Racecraft crew working hard during the wee hours of the night. When I got back to the pits the car was back out on track logging laps. The high pressure fuel pumped had failed, and it had taken about an hour to find the problem and fix it. Mary had volunteered to act as cook for the team. She had prepared meals ahead of the weekend and warmed them and set them out for the team. We also had a table full of snacks, fruit, and drinks that she kept ready for the entire event. Her efforts were greatly appreciated by everyone on the team. What a gal! 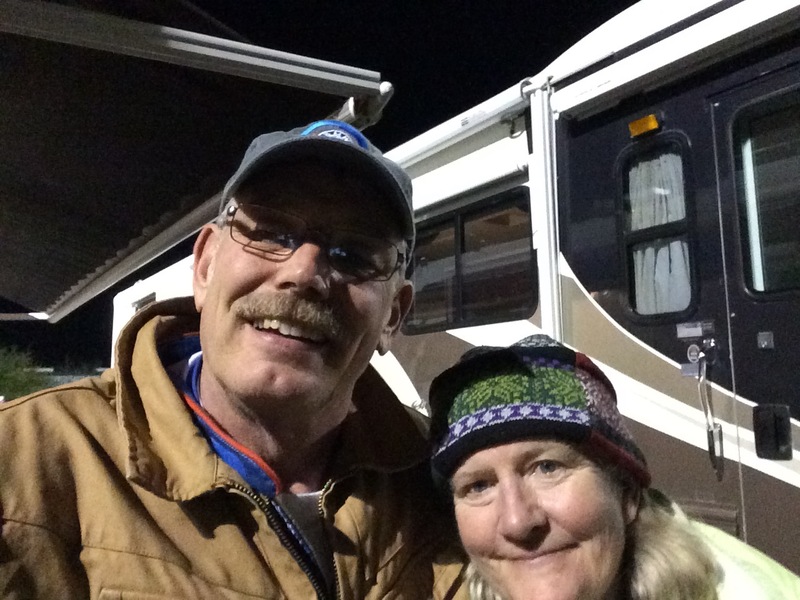 Mary and I late Saturday night after one of my stints. Her help and support was invaluable. Our race settled down again after the fuel pump replacement. We were able to do about 90 minutes on a load of fuel. The rules state that you can only change one tire during a pit stop unless you take the car behind the wall. We had developed a schedule of changing one tire about every 3rd or 4th stint. The system worked pretty well for us. Everything was going great until our pit stop and tire change about 2 hours from the finish. Unfortunately one of the wheel studs broke off. We debated whether or not to fix it and continue. We were far enough ahead of the next car in our class to stay ahead of them even if we stopped. At Mary’s urging the crew fixed the stud and I hopped back into the car and drove it to the finish. It would have been a shame not to drive the car under the checkered flag. It had taken about 30 minutes to fix. The agony of post race tech inspection. The whole crew stood by and watched. We finished the race 36th overall, but 2nd in our class! To keep that finish we still had to pass tech. Seems like a no brainer, except for the fact that we had filled in a tech sheet that qualified us for our class and now those items would be checked thoroughly by the inspectors. Fortunately we passed without any problems, so we got to keep our finishing position. What a fun event! I can’t wait to run it again. It is the type of driving that suits my style and skills to a tee. Following this event our trusty E30 was put up for sale. While it was very reliable, it was pretty slow. We got beat by a Honda Fit! We all want to run the event again, but with a better chance to place well. Currently the team is looking for another, faster car. I finally got the chance to do something I’ve always wanted to try- endurance racing. It was a real gas! Terry Forland, Jim Froula, John Hill and I all went together and bought a 1989 E30 BMW Pro3 car. 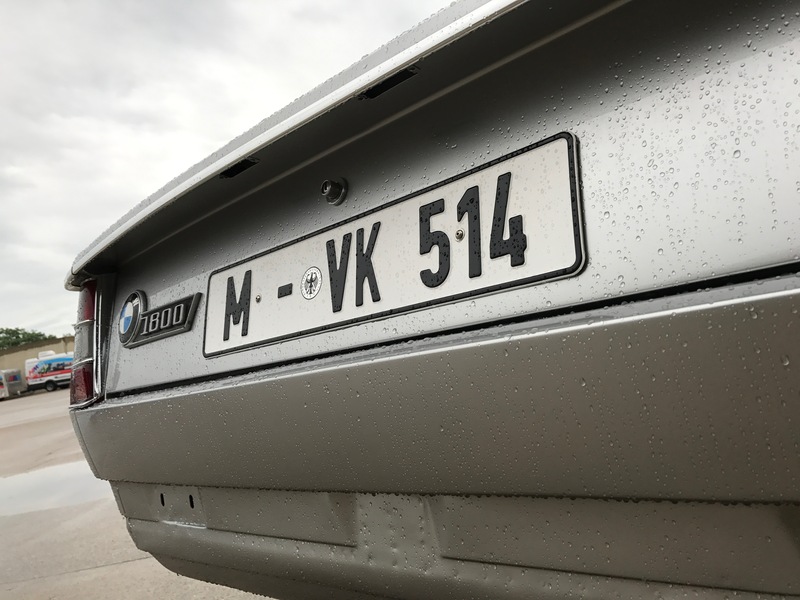 It was an old war-horse needing a few things, but E30’s are pretty simple, and the rules for Pro3 require only factory parts. We also purchased a couple of extra sets of wheels for the car. 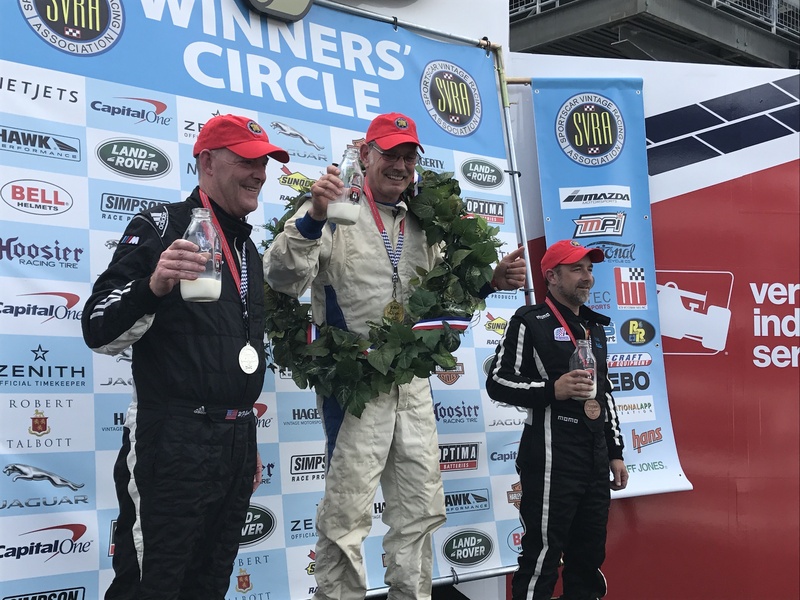 We ran it in the Cascade 8 Hour Race in Portland last October as a warm up for the 25 Hour race at Thunderhill in December. The 8 Hour is run without the chicane on the main straight. I used to race PIR in a lay-down go-kart without the chicane, so I quickly adjusted to not having to break at start-finish. The biggest problem for me was heading off into turn 1 in the pitch black at very high rates of speed. It was my first experience driving in the dark, and the lack of visual cues required some re-thinking. 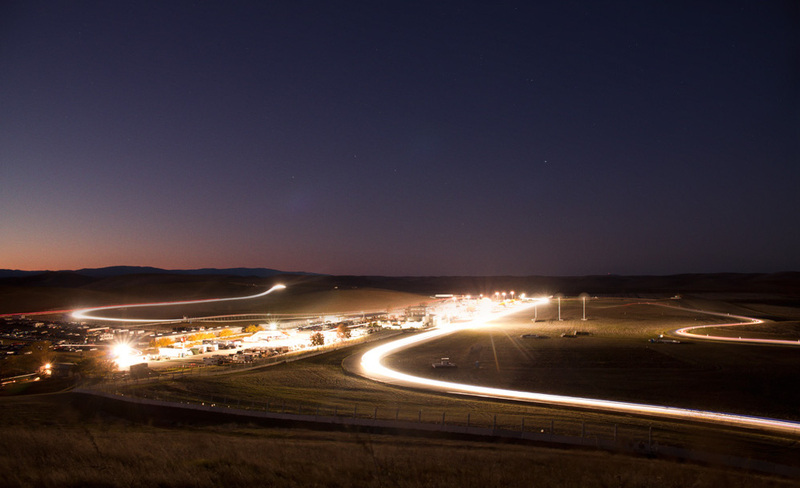 The 25 Hour Race at Thunderhill is held the first weekend in December, and it is a really big event. 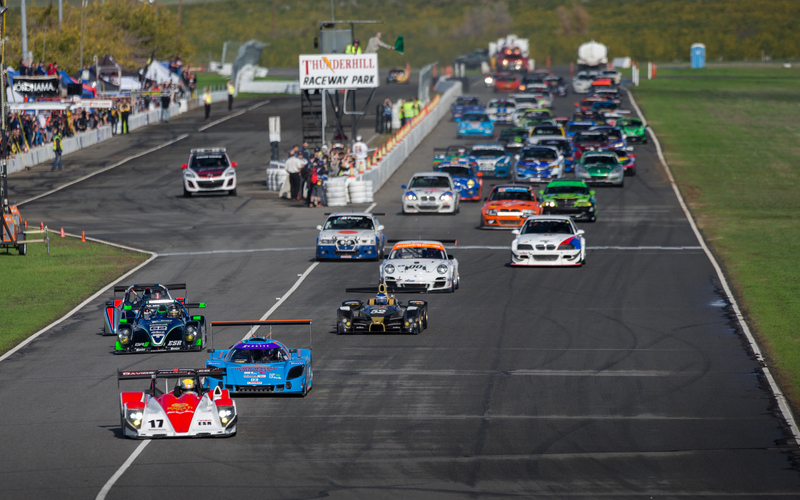 There are typically more than 50 entries, with several big teams and big names that run it each year- Randy Probst, Al Unser Jr., and Kurt Bush were all entered this past year. Walking through the paddock Friday afternoon before the race was eye-opening! The amount of equipment, people, and support stuff was mind boggling. It was not like the vintage races we usually attend. One team had 3 Radical sports racers they were running, with 6-8 mechanics for each car. Mazda had 3 diesel 6 series sedans entered that were being driven by a collection of their dealers. 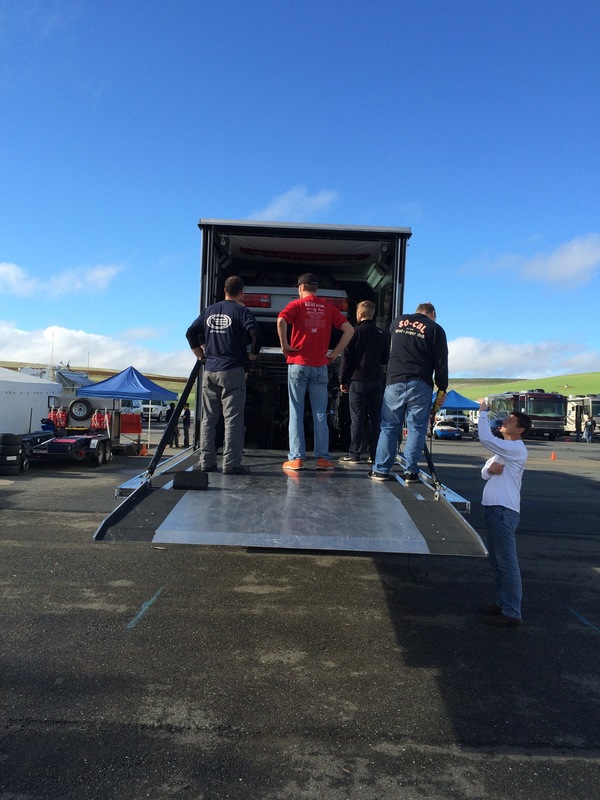 Unloading the might Pro3 car. 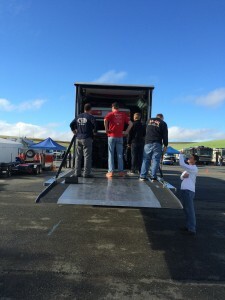 We arrived with the Racecraft semi loaded with our car and a spare E30 we could use for parts if the need arose. We figured that if the weather turned nasty the semi would also make a dry place for the team to hang out. As it turned out, that was never an issue. Once the car was unloaded and our pit area was set up the crew set about giving the car a last once-over. Brett and the crew spent time checking everything over one last time- the suspension, the brakes, the engine, and even the lights. Once that was complete it was time to tech and qualify the car. We had a bit of a problem in tech. When the officials looked over the roll cage they found some areas that had not been welded fully. These were up on top of the main hoop, and on the outsides of some of the diagonal braces. These were areas that you could not see, but had to feel by reaching in with your hand. The crew surged up and down the paddock looking for someone who had a welder. Finding one, Jim folded himself up and jammed himself into some tight corners, and welded up the bad places. The car went back to tech and passed. Qualification was on Friday night, and it began pouring rain about 30 minutes before we were scheduled to go out! I was chosen to qualify the car because I was the only one lacking sense. Being the old guy on the team has some advantages. The big plus for me was that the rules required the driver that qualifies the car also has to start the car in the race on Saturday afternoon. I ended up qualifying 43rd out of the 56 cars entered. A big problem I had to deal with was the fine spray put up by the cars with ground-effects. With our bright headlights it made it almost impossible to see. Quite a thrill! Friday night after the rain stopped. It’s pretty dark out there! This time of year it gets dark in northern California by about 4:30, and the sun doesn’t come up until after 7:30 AM. This means you spend a lot of hours racing in the dark at this event. 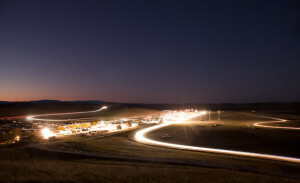 Thunderhill doesn’t have any lighting around the track itself. They have pretty good lighting in the paddock, and they rent portable lighting for pit-in and pit-out, but the rest of the track is pitch black. The lights you have on your car are critical. We had invested in a powerful LED light bar we could mount on the hood, plus a set of aircraft landing lights in place of the factory high beams. Qualification showed me that we needed to adjust them all slightly for maximum vision, but in general they were pretty good. Saturday dawned clear, dry, and cold. The norm for this event is pretty nasty weather, with cold temps, lots of rain, and even snow some years. Looked like we had gotten lucky. The cars are required to be on grid and ready to go by 10:30 or you have to start at the rear of the field. There is a lot of pomp and circumstance before the race with military color guards, bag pipes, and dignitaries walking up and down the grid of cars.